Arlene David expresses joy at the Honourable Patrice Nisbett’s presentation. 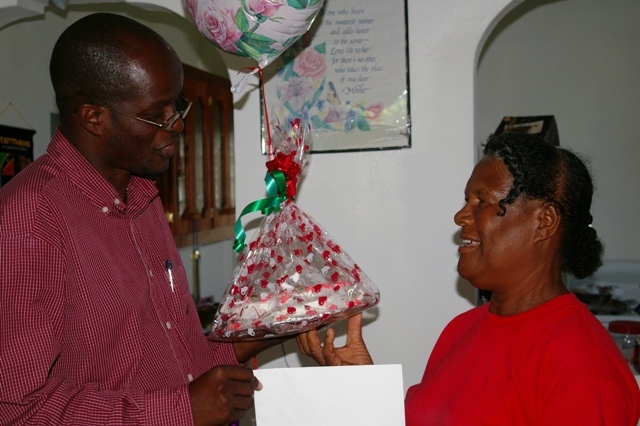 NIA-CHARLESTOWN, NEVIS (February 16TH, 2011) — Six residents of the St. James parish were, on Valentine’s Day, the recipients of red and white wrapped gifts, described as tokens of appreciation by federal parliamentarian the Honourable Patrice Nisbett. The women: Arlene David of Newcastle, Millicent Daniel of Butlers, Govanie Butler of Combermere and Icilma Daniel, Edris Jeffers and Olive Daniel of Fountain Village were recognised for their “consistent and constant” support of Minister Nisbett. 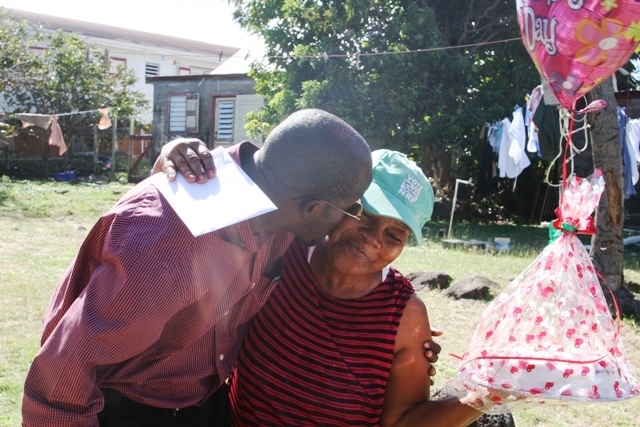 While the federal parliamentarian, who is also a resident of the St. James parish, said he was grateful for the love and encouragement of all his St. James’ parish-based supporters, he decided to honour the six women at that time. During his presentation to Ms. Butler, Minister Nisbett spoke of the recipient’s longstanding support of the Nevis Reformation Party, which governs the Nevis Island Administration. Millicent Daniel accepts gift from the Honourable Patrice Nisbett. “Ms. Butler, we are deeply appreciative of the consistent and constant support that you have given to us as a party and to us as an institution developing and moving Nevis forward. We want you to continue to support us. We want you to continue to rally with us,” he said. “We know it is a time when people speak about love and so I would want on this Valentine’s Day to shower you with some love by presenting this small package to you. I hope that this would be a tremendous encouragement in terms of your continued work in the development of the Fountain community. “Ms. Daniel is an ardent churchgoer and she is very instrumental in her church and in her community life. 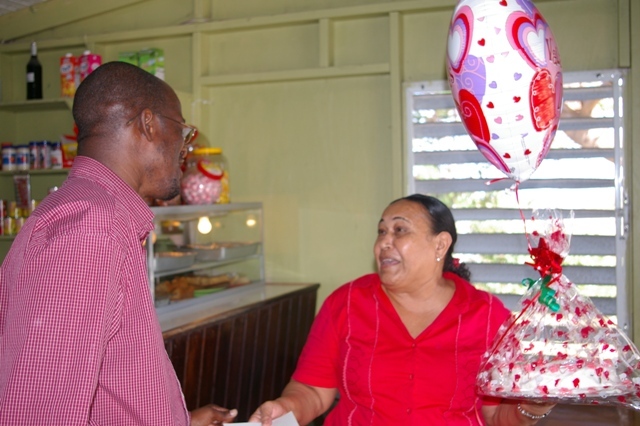 She has been part of the various different community organisations here in Fountain that I believe have made life a lot easier for the residents of Fountain,” Mr. Nisbett said. 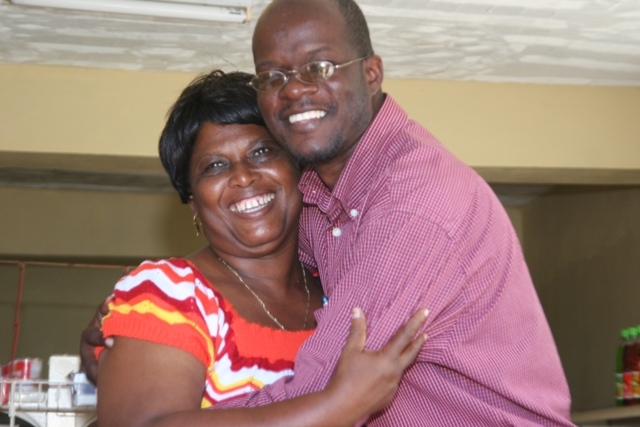 The Honourable Patrice Nisbett and Govanie Butler in a warm embrace. The six recipients recorded their gratitude to the government official and showered him with high praise. He’s a part of this [St. James] community,” she said. Icilma Daniel elated by the Honourable Patrice Nisbett’s presentation. 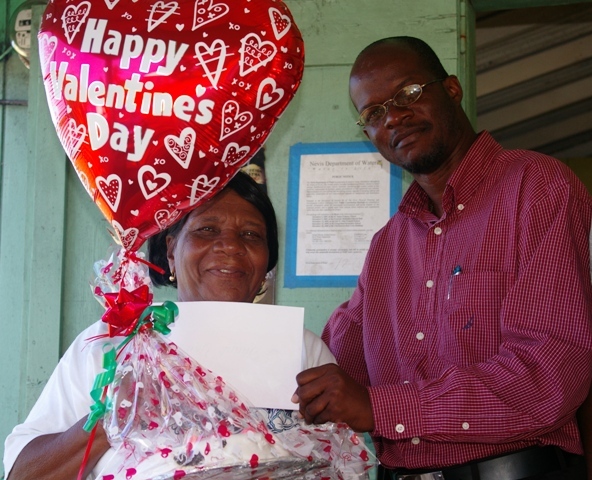 The Honourable Patrice Nisbett presents Valentine’s Day gift to constituent Edris Jeffers. 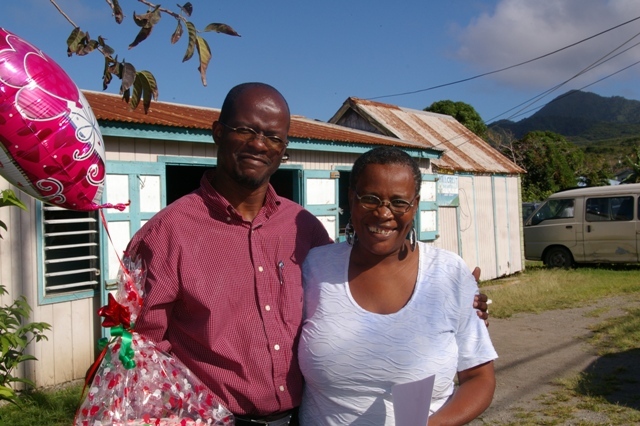 Olive Daniel accepts gift from federal parliamentarian the Honourable Patrice Nisbett.